Kindly look at this book cover and ... take a deeeeep breath. What is your first impression of Wee Gillis? Your first impression, just from looking at the red-green cover to the right. But wait - before I tell you what is on your mind - let me make a teeny weeny admission. I never wanted to buy Wee Gillis. This exciting book arrived as part of the incredible New York Review Children's Collection that I purchased almost blindfolded. That book set was one of my best buys in my Read Aloud Dad career. But that's an old story. A story about love at first sight. This is a story about falling in love. Do You Believe In Love At Second Sight? Back to your first impression of Wee Gillis. 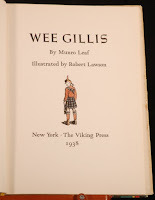 Oh, wait, I forgot to mention Wee Gillis was first published in 1938. 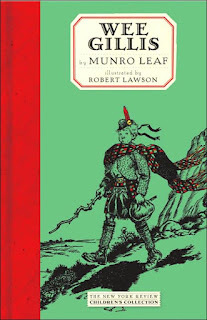 Author Munro Leaf and illustrator Robert Lawson were awarded a Caldecott Honor for this book in 1939. 1939. My mom was five years old then. Theodore Roosevelt's head was dedicated at Mount Rushmore. MGM's classic musical The Wizard of Oz premiered at Grauman's Chinese Theatre in Hollywood. Can we really get excited about a children's book from 1938 anymore? Do kids from the 21st century have anything in common with books that are more than 70 years old? But, back to your first impression of Wee Gillis. No one would blame you for thinking that a 1938 book such as Wee Gillis could be over the head of today's hyper-active kids. No one wants another dust magnet on the bookshelf, after the first attempt to read it to your kids fails. I'm ashamed to say - that's what I felt about this book at first glance - before reading it. I liked the book cover, but didn't expect to fall in love with the book. Somehow the Wee Gillis cover did not excite me enough. I felt it was certain to be out-of-touch with today's children. A story about a self-centred, pretentious boy perhaps? Well, it was completely the opposite. Wee Gillis is a book about a modest and musically talented boy who refuses to be dragged into petty quarrels between adults. No wonder I made such a misdjudgement. I forgot the author/illustrator talent that we are dealing with here. But, let's rewind time a bit. Let's travel back from 1938 to 1935. Amelia Earhart becomes the first person to fly solo from Hawaii to California. Airplanes are banned from flying over the White House. Parker Brothers releases the board game Monopoly. 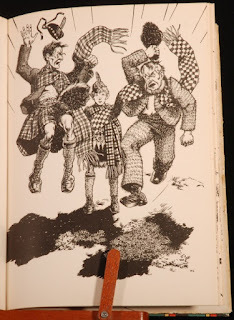 Before Wee Gillis was created, one Sunday afternoon in 1935, Leaf made up his mind to create a children's story so that his close friend Robert Lawson (at that time a relatively unknown illustrator) could show his talents. In less than one hour, Leaf composed the beloved 800-word story of Ferdinand as it stands today. Four years later, the duo magnifico joined forces to create Wee Gillis together. Yes, now you understand. There was no other option. Wee Gillis simply had to be a tour de force! Wee Gillis was created in 1938 - a time when boys didn't have to charge batteries before being able to have fun. Wee Gillis, is a coming-of-age picture book, in which our hero - a young Scottish lad - is torn between two sides of his family. His mother's family are all Lowlanders who raise long-haired cows, while his father's family are all Highlanders who stay up in the hills and stalk stags. Wee Gillis doesn't know that he will be expected to make up his mind one day. When the day comes, the two families put pressure on Wee Gillis to choose their side - but he does not want to make up his mind. Does he want to live up in the hills with his father's relations or down in the valley with his mother's relations? and he was cheerful and amiable. For one year he went to live with his mother's relations, where he rose early and took care of the cows. For one year he went to live with his father's relations, where he rose early and stalked the stags. This story starts out as a tale about obedience and tradition, yet develops into a story about personal growth, individual talent and compromise. You will see the eyes of your kids sparkle as Wee Gillis refuses to be drawn into a contest for his loyalty that takes place between the Highlanders and Lowlanders. This message is not lost on today's kids. My twins - who were expecting to hear a story in which Wee Gillis submits to the will of his family - were ecstatic when Wee Gillis refuses to be drawn into this game. 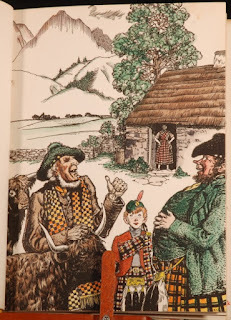 Wee Gillis finally tries his hand at playing an oversized bagpipe - and outpeforms his uncles, which finally leads to a very original resolution of the inter-family conflict. My baby boy and baby girls were fascinated with the resolution of the tug-of-war. 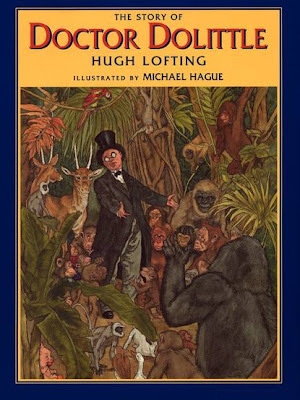 Congratulations to the NYR Children's Collection for reissuing this lost gem in luxurious hardcover in 2006. Although I've been away from home these past seven days, I read Wee Gillis over Skype to my twins tonight. Wee Gillis has been travelling with me in my suitcase. Magical squeals: "Read, Dad, Read!" "Come on dad. Read, Dad, Read!" When they saw it was Wee Gillis, boom! Excitement! They saw the "missing" book over the webcamera again. A book from 1938 connects with kids from 2011 - perfectly, from our experience. My little pumpkins love Wee Gillis even more than they love Ferdinand. And that's a big kind of love.